When Tania Nyman’s 9-year-old son decided a year ago to type a page of his homework rather than handwrite it, the experiment did not go well. Next school year, the 9-year-old’s keyboarding skills will once again be put to the test. Quite literally. 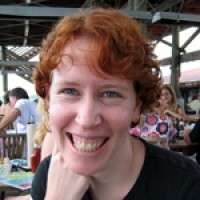 In the spring of 2015, Louisiana school children will start taking online tests created by the PARCC consortium (Partnership for Assessment of Readiness for College and Careers), a multi-state collaborative working to create exams aligned with the new Common Core educational standards. At a macro level, the tests place new technology demands on schools and districts: To take PARCC, schools have to have newer computers, and more of them, plus sufficient bandwidth. The state recommends at least a 7:1 student-to-computer ratio and an Internet connection fast enough to transmit one gigabit of data per second. But the technology makes demands on students as well. The writing component of the test will likely require fourth graders to type a minimum of one page in a single stretch; fifth graders will probably have to type at least two pages. Most secondary and college students are expected to type, rather than handwrite, their essays. But asking students as young as eight and nine to type several paragraphs on a standardized test presents entirely new challenges. In an attempt to ward off disaster, school leaders are contemplating adding keyboarding classes, introducing online assessments in kindergarten, and taking students to the computer lab for writing class. Some local educators say they are particularly worried about low-income students who text with ease in an age of ubiquitous cell phones, but generally have less exposure at home to computers and more-expensive mobile devices, such as tablets, than their middle-class peers. “I’ve heard professional development leaders say most kids have been on iPads since they were 2,” said Katie Patterson, the director of Common Core strategy for the nonprofit New Schools for New Orleans. “That’s not a true statement for kids in poverty.” Forty-two percent of New Orleans schoolchildren live in poverty, nearly double the national rate. The PARCC will require a leap on both a cognitive and technical level, says Patterson. Louisiana’s old standardized tests, the iLEAP and LEAP, asked young students to write a paragraph in response to a short reading passage. But, unlike the PARCC, the old tests did not usually require students to cite evidence from the text or type their response. As a result, many New Orleans schools now consider keyboarding skills — including how to type quickly, use a mouse, or click and drag — as foundational for young children as handwriting. At the three New Orleans charter schools operated by the Choice Foundation, administrators hope students will learn largely through practice. This year, all students at the schools started taking an online test known as MAP (Measures of Academic Progress) for the first time, partly in an effort to ensure they are ready for PARCC in a year and half. Schools use tests like MAP internally to see which skills they need to work on over the course of a school year; the state does not use results to grade a school’s performance. Overall, the students were more at ease than their teachers expected, particularly with using a touch screen. “They just see computers as a game,” Jurkunas said. But the younger children struggled with manipulating the mouse and typing — skills that can’t be learned from the casual use of cell phones or smart phones. “Kids would hunt and peck really fast,” said Jurkunas. New Orleans’ KIPP network has been using the MAP test for three years, said Todd Purvis, the principal of KIPP Renaissance High School and the network’s chief academic officer. He’s found there are a range of skills that need to be retaught and rethought for the new medium. For instance, teachers have long shown children how to highlight and annotate key phrases on paper. Now, KIPP teachers show them how to annotate and highlight online texts. 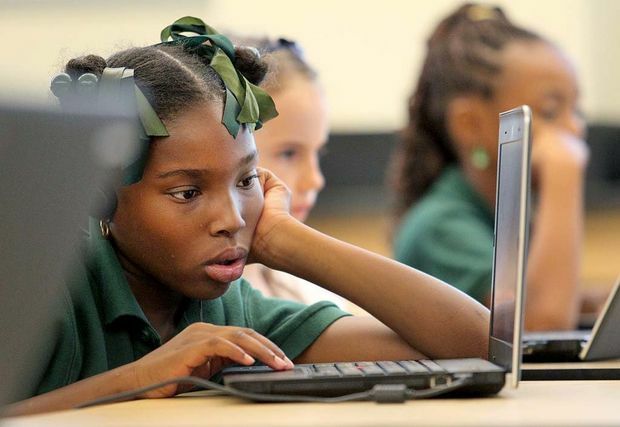 In response, KIPP New Orleans is integrating computer skills into ordinary classes and instituting a range of technology pilots – both for testing and to teach skills. Every KIPP Central City sixth-grader has a Chromebook laptop. At KIPP Renaissance, study hall has been replaced by Learning Lab, which includes self-paced research projects, video instruction via Khan Academy and yes, typing lessons. The school hasn’t cut enrichment classes to make room for computers but rather has redone schedules and eliminated some independent-study times. Nyman, whose two sons attend public schools in Baton Rouge, knows her sons might need extra help. Like the students at the Choice Foundation charter schools, they are adept at touch screens thanks to time spent playing games like Minecraft. But they have had little exposure at home to a keyboard and mouse. She is leery, however, about setting aside additional class time for preparing students to take standardized tests. “You already see the loss of arts and music,” Nyman said.